"When we travelled throughout Thailand, there were boys like that all the time," said Apichat Rutnin of the Thailand Extreme Sports Association. "It's a child's dream to run away with the circus." At 11-years-old the waif skater stowed away in a bus to reach the capital, found his way to the team's training park and waited 10 hours for them to show up. "We were moved by his tragic story and we took him in," said Apichat. "Normally a guy who joins our team must qualify at a certain level but we thought we'd try him out." Oat was not the most gifted skater, according to Apichat. But he was confident, determined and disciplined. "He didn't watch TV or play games like other kids," he said. "He was always the first one there and the last one to leave." Oat flunked his first competition -- coming in last -- but it only strengthened his resolve. By 14, he ranked number one in the amateur skating ranks and joined the top tier. Two years later, he was Thailand's number one skater, a place he has kept for the past eight years. Grinning broadly, Apichat described the gamble to take in Oat as a "very good decision". 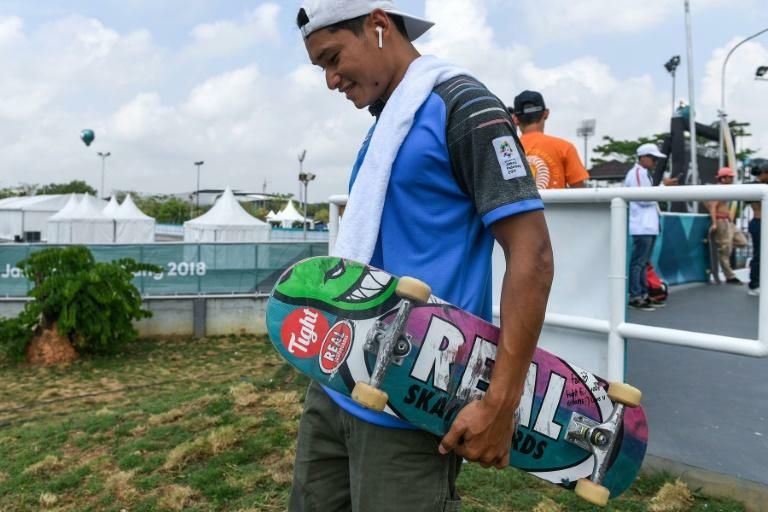 At the Asian Games, Oat narrowly missed out on a medal -- appropriately in the 'street' category -- demonstrating a slick array of tricks on the rails, stairs and ramps. But he already has his sights fixed on Tokyo 2020 in the hipster sport's Olympic debut. The Thai government has paid for the team to train in California, where Oat "hit a new level", according to coach Eric Kirkwood. Skaters in the United States and elsewhere in the West have been able to carve out a career thanks to sponsorship deals, until recently resisting overtures to join the Olympics. That's not the case for most skaters in Asia, which has few homegrown skate brands with cash to burn. But training for an Olympic sport adds a degree of legitimacy -- for government ministries and concerned parents. "The same guys that would have had to stop (skateboarding) are now being supported by the government," said Kirkwood. "They just get to skate." Oat has been back many times to Suphanburi to train. One day, he passed his aunt's house and when his relatives heard he was in the national team, they hugged him for the first time. Gone were the days when they used to tell him off for "hanging out with drug addicts" at the skate park. "They're not drug addicts," he would snap back. "They're athletes -- and it's a real sport!"